Stunning metalized chrome-plating and our superfine Penguin Super Silk*, veil our #1 table flag, for an even classier look. 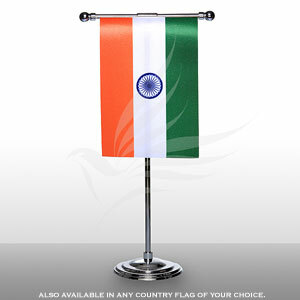 Shimmering soft silk & a durable moulded-plastic base adds an elegant flair to this vertical desk flag. One of our most popular table flags, it is light-weight, yet amazingly stable. Economical, yet very classy. An ideal choice for gifting or personal use. T-shaped moulded plastic attachment with 4" slitted staff, mounts perfectly onto the 10" vertical staff.